Does the LG G2 have what it takes to be your next smartphone? It seems like I’m never satisfied when it comes to my phone. There’s always some feature missing that is available on another brand phone or model. One of the latest Android smartphones on the market is from a company that you might not have considered when shopping for a new phone with all of the latest and greatest features. 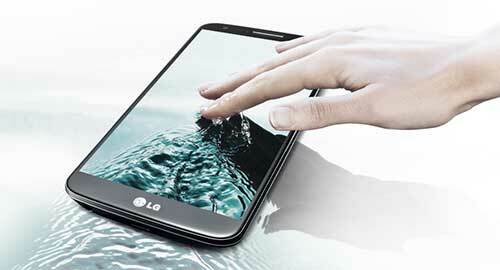 It’s the LG G2 and it looks like a winner when it comes to tech and specs. Let’s check out some of the cool features that have me curious about this new phone. Camera: The G2 has packed several nice features into its built-in 13 megapixel rear camera. It offers optical image stabilization that stabilizes the focus, which is great for video, action shots and low-light situations. It also has an auto–focus feature that uses nine focus points that can track multiple faces or moving objects. The ability to record from both the front and rear facing cameras at the same time isn’t new, but LG takes it a step further by letting you add some cool effects to video with the new Tracking Zoom feature. Just tap on a subject while recording and the software will track and record that subject in a picture in picture frame that overlaps the video while also recording the rest of the scene. Rear Key: Staying with the camera, the LG G2 has a feature we’ve yet to see on any other phone till now. It has a rear key that can be used as a shutter button. Now you can take those selfies much easier. The Rear Key is actually a departure from other phones as the LG G2 has removed the volume and power buttons from the edges of the phone and moved them to the back where it’s easier for left or right handed people to adjust them while talking on the phone. KnockOn: Now you can wake up your phone just by tapping twice on the display. Knock Knock, anyone home? You can also answer calls just by lifting the smartphone to your ear with the Answer Me feature. This would be handy in the winter when you are wearing gloves and can’t swipe or tap the display to answer an incoming call. QSlide 2.0: This is multi-tasking made easier. Slide Aside allows you to quickly switch between as many as three apps with a swipe of your finger and Qslide lets you run multiple apps on top of another application, with customizable size and transparency. With these features, you can be writing an email, then slide it aside to check a date in your calendar, then slide back to the email to continue writing. TV remote: The LG G2 gives you the ability to control your home theater devices by converting into a programmable remote with the built-in IR emitter and app. Use it to operate compatible TVs, sound systems and more. Here’s a quick video that demonstrates some of the features I’ve mentioned above. So what do you think of the LG G2? I can’t wait to get my hands on one for a full review. Does the LG G2 have what it takes to be your next smartphone? originally appeared on The Gadgeteer on September 15, 2013 at 8:00 am.